The formation of matter (defined and organized structure or form) is an autopoietic process in that each material structure is self-generating and self-perpetuating. Each unit is self-contained and occupies its own Space and time. The idea of Space and time limits (dimensions) was born from or with the split mind or dual (reflected or egoic) consciousness (1.1) sometimes referred to as Newtonian (Analog) Physics or simply erroneous beliefs. With the idea of limits comes the idea of Space or a "place" where limits can exist. Any Space must be defined (more limits). This definition must of necessity have dimension. At the time of the Void there is nothing in Space but there is dimension or orientation of direction. There is a sense of direction of in and out (towards or away from self, the fundamental basis of all vibratory and/or oscillatory motions) (1.1). Initially, two dimensions, directions, conditions or poles are established. This process is not linear in that dynamics do not occur sequentially. If there is established an in and out from a point there must be concurrently all three directions as shown in Figure 3.2 - Thinking Mind Creates a Universe of Motion because an in and out motion is in all directions at once. However, using linear thinking can help to sort through complex issues. Figure 3.1 - In and Out Vectors or Directions. The two initial states are 1) to separate, disperse or depolarized and 2) to be Unified, One or polarized; and are nothing more than tendencies or desires. The first tends in a direction directly away from the center/unity (entropic). 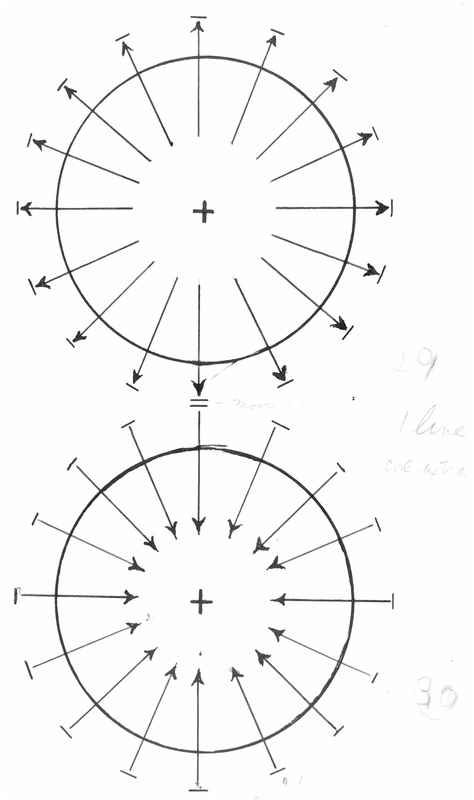 The second tends to a direction towards the center/unity (syntropic or negentropy). The two opposing tendencies cancel, neutralize or void each other's state or condition in certain octave and time relations. Since there are only two states they are initially in perfect equilibrium one against the other and that condition is said to be neutral - where is no motion or form/substance. These two seemingly opposite states are what they are because of polarization. Polarization is evidenced in reciprocity of all characteristics including but not limited to: a) density/vacuity b) expansion/contraction c) motion/non-motion, etc. See Part 12 - Russells Locked Potentials for discussion on the many polar characteristics or attributes. All activity is an effect of polarization attempting to depolarize into neutral Space or depolarized Space desiring to become polarized force and matter. Unfortunately, conventional science only recognizes the former - the death side of the equation while ignoring the latter, the Life side. Figure 3.2 - Thinking Mind Creates a Universe of Motion.